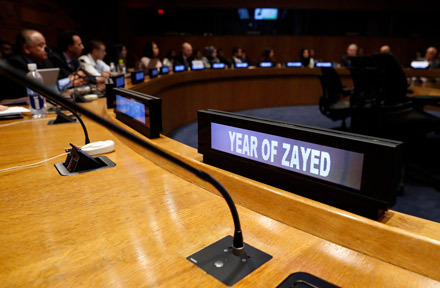 The UAE commemorates the environmental legacy and leadership of the late Sheikh Zayed Bin Sultan Al Nahyan at a special event organized by the Zayed International Foundation for the Environment at the UN Secretariat in New York. Heeding the call of HH Sheikh Mohammed bin Rashid Al Maktoum, Vice President and Prime Minister of the UAE and Ruler of Dubai, to “deliver a message to the world in 2018 that Sheikh Zayed exists, and that he will remain in the hearts and minds of every lover of the UAE”, a special event was held to commemorate the environmental legacy and leadership of the late Sheikh Zayed Bin Sultan Al Nahyan at the UN Secretariat in New York. 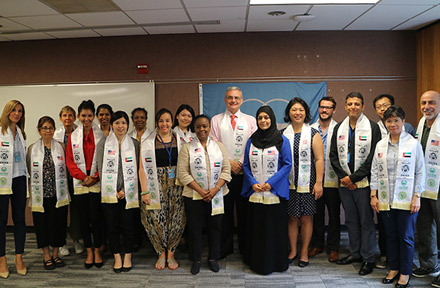 In collaboration with Dubai Police, the Zayed International Foundation for the Environment took the initiative in organizing this commemorative event on 23rd July 2018 with the support of the Permanent Mission of the United Arab Emirates to the United Nations and the UN Office for South-South Cooperation. Titled “Commemorating the Environmental Legacy and Leadership of the late Sheikh Zayed Bin Sultan Al Nahyan”, the event was held as part of celebrations for the 2018 Year of Zayed that marks the 100th anniversary of the birth of the Founding Father of the UAE. More than 70 participants, including Ambassadors and senior delegates from Costa Rica, Greece, Georgia, Lebanon, Malaysia, Nigeria, Poland, Russia, Saudi Arabia, the State of Palestine, the Arab League and the European Union, as well as delegates from many other Member States, UN entities and civil society organizations attended the event. Delegates and senior personnel from various UN organisations including the UN Office for South-South Cooperation, UN Department of Peace Keeping Operations, UN Department of Economic and Social Affairs, UN Operations & Crisis Centre, UN Department of Management, United Nations International Children’s Emergency Fund, UN Women, and United Nations Educational, Scientific and Cultural Organization, actively participated in honoring the environmental stewardship of the late Sheikh Zayed. Dr. Meshgan Al Awar, Secretary General, represented the Zayed Foundation and delivered a keynote address at this prestigious event aimed at promoting and spreading the concept of sustainability and the culture of green living worldwide, showcasing the UAE as a role model in environmental sustainability. H.E. 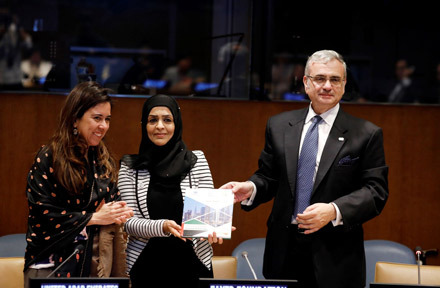 Lana Zaki Nusseibeh, Ambassador and Permanent Representative of the United Arab Emirates to the United Nations, provided opening remarks honoring the environmental legacy of the late Sheikh Zayed bin Sultan Al Nahyan, in the presence of UN member states. In her address, Ambassador Nusseibah reflected that as an arid country, the UAE has always been concerned with environmental responsibility and sustainability. She added that this was always at the forefront of Sheikh Zayed Bin Sultan Al Nahyan’s plans for the development of the UAE. “Sheikh Zayed firmly believed in protecting the environment and natural heritage that is an important part of the UAE and underlined the need to safeguard it for future generations,” emphasized Ambassador Nusseibeh. The ambassador highlighted Sheikh Zayed’s regional leadership in environmental sustainability and also applauded Dubai Police and the Zayed International Foundation for the Environment for advancing his legacy and vision in the international arena. Dr. Meshgan Al Awar, Secretary-General of the Zayed International Foundation for the Environment, provided keynote remarks and elaborated on Sheikh Zayed’s vision for environmental conservation. 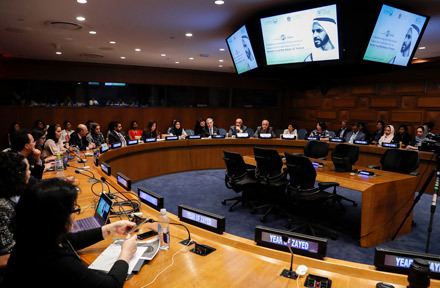 She reminded participants of Sheikh Zayed Bin Sultan Al Nahyan’s strive for sustainability, becoming a world leader in this area decades before the United Nations began to develop the sustainable development goals. "Sheikh Zayed placed a strong emphasis on education and capacity building, particularly of youth. He invested heavily in protecting endangered species such as the Arabian Oryx, falcons, sea turtles, in addition to the establishment of Protected Areas, because he believed that each living organism has a role to play in the natural balance," emphasised Dr. Al Awar. She added, "The best manifestation of Sheikh Zayed’s efforts is what we can see in the UAE today - a green oasis in the desert, providing a model for development in an arid region. His dedication to sustainability came 41 years before the adoption of the Sustainable Development Goals, and his dreams have been translated into the policies and programmes that we see in the UAE today." 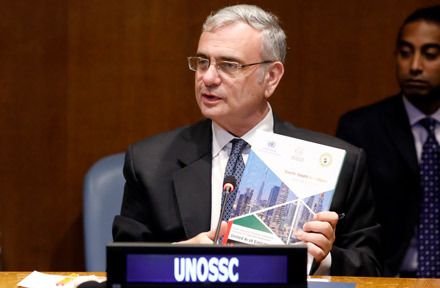 Jorge Chediek, Envoy of the Secretary-General on South-South Cooperation and Director of the UN Office for South-South Cooperation (UNOSSC) also commemorated the vision of the founding father of the UAE, as demonstrated through the nation’s foreign policy, which places a strong emphasis on international cooperation and support. He also thanked the Government of the UAE and the Zayed International Foundation for the Environment for their commitment to sustainable development, including their role as host of the 2016 Global South-South Development Expo in Dubai, UAE. He remarked that “in under 50 years the UAE has grown from a developing country to an advanced economy, and is now working to share the solutions that enabled this development. In all that it does, the UAE embodies the spirit of South-South cooperation”.